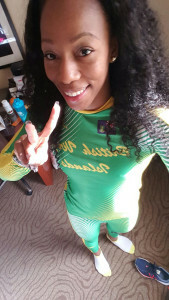 Ashley Kelly made her outdoor season debut a memorable one by becoming the second BVI athlete qualifying for this summer’s Rio Olympic Games in the 200m while Chantel Malone claimed the Long Jump title also in a season’s best at the Florid Relays. Kelly finished second in the 200m in 23.17 seconds in the process of lowering the 23.36 she ran last year for the No. 2 mark on the BVI’s All Time List behind Rio Tahesia Harrigan-Scott’s 22.98 from 2007. Kelly returned 35 minutes later and had her fastest 400m time since competing for Illinois, when she covered the oval in 52.95 seconds. Although qualifying for Rio, Kelly said when she saw her 52.95 seconds 400m time she was really excited about it. Malone leapt 6.66m in the Long Jump—missing the Rio qualifying standard by 4cms and her personal best established last year by 3cms. In Arizona, coming off demolishing her twin sister Trevia’s Hammer Throw Record with a whopping 56.13m heave that upped her best from 44.99m, Tynelle Gumbs won the Arizona Colleges Athletics Championships with a heave of 47.78m. She also won the Discus Throw with a mark of 43.42m, after taking out another of her sister’s mark that stood at 46.49, with a 47.36, effort in Texas last weekend. Tynelle was third in the Shot Put with 12.96m, followed by Trevia in 12.68m. Tynelle picked up her third victory, taking the Javelin Throw with a mark of 39.52m.